This entry was posted on April 14, 2013. Bookmark the permalink. The sun was shining, the sky was blue, and I was grumpy. My body and mind were not happy with my decision to wake up early and head out on a bike ride before work. But that frown soon turned upside down once I hit Golden Gate Park, naturally. Cruising into Golden Gate Park, my grumpiness started to fade when I was granted my first smile of the day: a herd of strollers. But not just any kind of strollers. 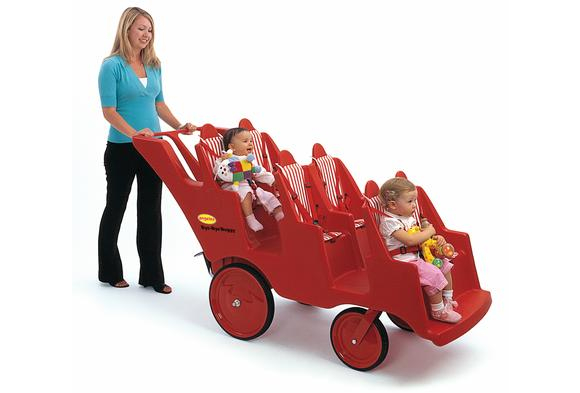 Strollers so big and creatively crafted that they evoke a sense of awe. Two rows wide and three rows deep, a big red bright stroller with stadium-like seating carried 6 children. And by its side was another remarkable vehicle, like one I’ve never seen– four grey seats, stacked one behind the other, also in movie theater style. Having a hard time imagining this? Don’t worry, I’ve provided evidence such strollers do exist. Ten children in two bus-like strollers. How heavy must that have been? Similar to dog walkers in the city, do you think there are children walkers? I wonder… it is San Francisco, so anything is possible. That smile was still going strong when I hit the beach, hung a left, and started cruising along the bike path parallel to Highway 1. Like a mirage in the desert, I saw something slowly approach me. As I grew closer I was able to discern the image and confirm that it was in fact what I thought. A guy in his mid-twenties was walking down the path at 7:30am, all by himself with nobody else around, with both hands up giving steady peace signs, grinning and nodding his head as if repeating the mantra, “Uh huh, yeah, that’s right. Peace baby.” I returned the smile and nod when I rode past him. As most Wes grads living anywhere other than NYC or Boston know, this kind of question sparks immediate excitement. I swiveled around and said, “Yes!” which unleashed an equivalent, or dare I say even more, level of excitement in Carol-Jean. Within seconds Carol-Jean delved into her childhood stories, telling me the ins and outs of growing up in Middletown, CT, stories that covered crashing Wesleyan parties, the Polish churches she attended (we bonded over that-I’m Polish too, although I’m not so churchy), and so on. She told me about each and every house she lived in and on what streets they were. I nodded in agreement as if I totally remembered every single spot in the city. We reminisced about O’Rourkes (an incredible diner) and It’s Only Natural, a vegan restaurant that is a hit among the Wesleyan folk. Honestly, I was quite surprised she ate there. We both agreed that their sweet potato fries are to die for. Carol-Jean then began to tell me that her grandmother recently died at 99 and that she had read her diary when packing up her stuff. Wesleyan was all over it– mainly stories about dating Wesleyan guys (it was an all-guys school back in the day). From there conversation went to how she just got acupuncture up the street from my house, which digressed into a brief summary of her ailments to get me up to speed. I learned a lot about Carol-Jean that day– maybe more information than I really wanted to know– all because I was carrying a Wesleyan tote and because this is San Francisco, an eclectic city filled with eclectic people who happen to make me smile every single day.